Pat Brady was going through a hot stretch in August 1992, one that was getting him some notice from his manager, The Reading Eagle wrote. He'd had homers in two-straight games and RBIs in six-straight, all after a move from outfield to third base. "Oh, boy, is he swinging good right now," manager Don McCormack told The Eagle of Brady. "He's come up with some big base hits and big RBIs." Brady had already swung well enough that year to make AA for the first time, at Reading, in his fifth season as a pro. Also that year, Brady would even get a brief look at AAA Scranton. Brady, though, would go on to play just two more seasons. He would never get a chance to test his swing in the majors. Brady's professional career began in 1988, taken by the Giants in the 34th round of the draft, out of St. Mary's College of California. Brady started at short-season Everett, hitting .235 in 63 games. He also hit seven home runs. He moved to single-A Salinas for 1989, then split 1990 between high-A San Jose and and single-A Clinton. Between San Jose and Clinton, Brady hit just .218. It was his final year in the Giants organization. 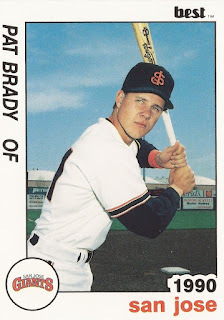 For 1991, Brady moved to the Phillies and high-A Clearwater. He knocked a two-run triple in an April game. He ended the season with a .247 average. Then came Brady's move up to Reading and then Scranton in 1992. He split 1993 between the two levels, but hit just .231. He started 1994 at Scranton, moving mid-season to the Tigers and AAA Toledo. Going into 1995, Brady signed on with the Athletics, playing replacement ball. In mid-March, Brady told The San Francisco Examiner his goal wasn't just to play for the team he grew up loving, it was also a chance to show what he could do. "Whatever happens with the strike," Brady told The Examiner, "hopefully they saw me enough and liked me enough that they want to keep me in the organization." When the strike ended, though, Brady's career also ended, without making the majors.